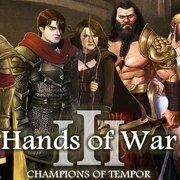 Hands of War 3 champions of tempor is out with awesome new features. Restore the power of heartstone and unite the broken land with your fighting skills. Select one of the three classes that are wizards, rangers and warrior before starting the game.